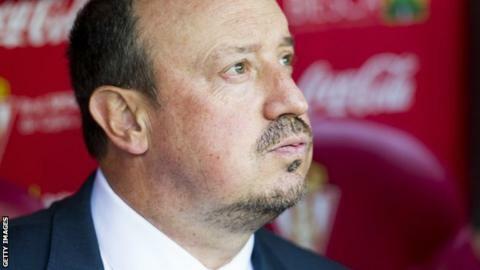 Real Madrid sack Rafael Benitez: Was he doomed from the start? Rafael Benitez was probably a dead man walking from the moment he was controversially appointed Real Madrid manager in the summer. Seven months after becoming Florentino Perez's 10th managerial appointment as Real president, Benitez has made way for the 11th. Unlike the Spaniard, successor Zinedine Zidane is a Real Madrid legend, adored by the club's supporters. He also gets on with the players. They are just two of the reasons Benitez's time in charge was doomed. BBC Sport looks at the factors behind his departure, and how Real have reached such a desperate situation so soon after his appointment. There was strong opposition to the sacking of Benitez's popular predecessor Carlo Ancelotti, whose 2014 Champions League triumph and easy-going manner made him a highly respected figure both inside and outside the Bernabeu. Even Perez seemed unsure about his decision, addressing a news conference by starting to answer a question about why he had sacked Ancelotti with a shrug of the shoulders and a muttered "I don't know…"
And there was plenty of scepticism about the suitability of Benitez, a man who had enjoyed precious little success in the past decade and who had developed a reputation - whether deserved or not - for negative, defensive football. Shortly before Ancelotti's sacking, an opinion poll in daily sports newspaper AS saw Benitez receive only 8% of the votes as the best option to manage the team, while an article in Marca listed 18 reasons why he would be a bad choice. Pointedly, that article included the observation people "would struggle to give him the benefit of the doubt". That certainly proved to be the case as everyone - fans, players and the media - appeared only too willing to leap upon any opportunity to criticise Benitez. Hardly grounds for dismissal, but with Benitez it appears not to matter because - as he once complained - he seemed to get nothing but criticism whatever he did. Having arrived at the Bernabeu surrounded by such scepticism, the only way Benitez could have ensured his long-term position was by leading the team to a hugely successful run of form with goals galore and victories flowing on a weekly basis. That never happened. Even though Real were unbeaten for their first 14 games under Benitez, two of those were goalless draws against lowly Sporting Gijon and Malaga, which attracted initial grumbles. The first major criticism arrived following a 1-1 draw with local rivals Atletico Madrid in October. Real took an early lead through Karim Benzema but then went on the back foot - including the substitution of a clearly disgruntled Benzema - and conceded a late equaliser, prompting inevitable complaints about the manager's perceived negativity. But that was nothing compared to the avalanche of abuse endured by Benitez after Barcelona's sensational 4-0 Clasico victory in November, which concluded with loud chants for the former Liverpool manager's dismissal ringing around the Bernabeu after his team were utterly outclassed by their eternal rivals. Benitez survived that trauma, but he never really recovered and from that moment his departure was just a matter of time, with every home game since the defeat by Barca preceded by loud jeers when Benitez's name was announced with the team line-ups. Though it certainly wasn't entirely his fault, the club's expulsion from the Spanish Cup after fielding an ineligible player did Benitez no good whatsoever, and a limp 1-0 defeat at Villarreal in mid-December ensured the negative atmosphere was maintained heading into Christmas. So the news of his departure comes as no surprise, with Benitez's reign finally buckling under the weight of weeks of relentless pressure. Zidane's appointment is also no surprise, because he has long been earmarked as a future Real Madrid manager, with his status as Benitez's expected replacement splashed across the front page of Marca on 27 December under the headline 'The Chosen One'. That headline was a deliberate reference to Jose Mourinho, the ex-Madrid boss who has retained a good relationship with Perez and had been touted as Benitez's potential replacement - an idea swiftly abandoned after it provoked a predictably negative reaction. Zidane is a legend at Real, winning six titles and providing one of the club's iconic moments with a stunning volley in the 2002 Champions League final victory over Bayer Leverkusen at Hampden Park. He has always been a big favourite of Perez, who was responsible for bringing him back to the club initially in a behind-the-scenes role but then as Ancelotti's assistant. The Frenchman's coaching career was given another shove by Perez in the summer of 2014 when he was named boss of the club's B team, with the president even prepared to accept the administrative wrangling that followed his appointment of a man lacking the necessary coaching badges. In appointing Zidane, Perez is hoping to follow the examples set by Pep Guardiola and Luis Enrique at Barcelona - a highly regarded former player who cut his coaching teeth with the club's B team, understands the club's 'DNA' and commands absolute and instant respect. Whether Zidane will be able to work in the same kind of environment that allowed Guardiola and Enrique to flourish and win medals galore is another matter. Is Perez saving his own skin? Benitez is by no means the only high-profile figure at the Bernabeu being criticised, because Perez has also been on the receiving end of the fans' unhappiness. Chants against the president just as loud as those against Benitez accompanied the final whistle of November's embarrassing loss to Barcelona, and the slogan "Florentino dimision!" ("Florentino resign") has become a familiar refrain at the Bernabeu and on social media. Perez has been held responsible for two things: building an unbalanced squad over-packed with glamorous attacking players (Cristiano Ronaldo, Gareth Bale, James Rodriguez, Isco) who play in similar positions, and overseeing general administrative incompetence such as the Copa del Rey expulsion, the bungled attempt to sign David de Gea and the constant turnover of managers. Amid such unhappiness, something had to give and Perez - consummate politician to the end - was predictably in no hurry to offer his head when the option of sacrificing a widely unpopular manager was also available. That alone won't be enough to stem the tide of criticism against the president, and the possibility of Perez potentially being forced into calling early elections remains alive. Are the players to blame? There has been plenty of unhappiness with Real's players, as well. Even Ronaldo, the club's all-time leading goalscorer, has not been immune from barracking and was spotted on camera mouthing obscenities towards dissenting fans during the bizarre 10-2 victory over Rayo Vallecano. Throughout his short reign, Benitez was regularly beset by reports he had failed to develop good relationships with his key players, many of whom were outspoken in their support for Ancelotti before and after his sacking. Specifically, there have been claims Benitez did not get along with Ronaldo, Benzema, long-serving captain Sergio Ramos, and attacking midfielders James and Isco, both of whom have been regularly left out of the starting line-up over the course of the season. A neat illustration of the perceived lack of respect for Benitez within the dressing room came at the start of December's defeat at Villarreal. As he took his seat in the dugout, substitute Isco noticed he was being filmed by TV cameras and ostentatiously grinned, stared at fellow sub Toni Kroos, rubbed his eyes, shook his head and stared again in the direction of Kroos, apparently intending to convey the question: "Can you believe he's on the bench?" Such public displays of petty dissent undermined Benitez's claim he was supported by his players, and with a manager similarly ridiculed by fans and the media they could get away with it. But with Zidane in charge, there will be more expectation on those superstars, very few of whom have performed consistently well this season, to start living up to their reputations. One player never linked to the internal criticism of Benitez, and whose reputation among Madrid fans has been enhanced this season, is Wales star Gareth Bale. The former Tottenham man was affected by injuries earlier in the campaign, but he has been in excellent form since returning to fitness and has scored nine goals in 13 league games so far this season. Indeed, his performance in Sunday's 2-2 draw at Valencia was one of his best in a Real Madrid shirt, as he conjured a brilliant backheel to help set up Benzema's opener and then scored a superb header for the second goal - his seventh in the past five games. So Bale, despite the team's travails, is in a good place - and the appointment of Zidane could be further positive news, because the Frenchman has been one of his staunchest admirers. During Madrid's wooing of Bale before his big-money move from Tottenham in the summer of 2013, Zidane - then director of football - identified the Welshman as the player in Europe who had impressed him the most that season. After his move was completed, Zidane hailed Bale as one of the three best players in the world (inferring that only Lionel Messi and Ronaldo are better). When you also consider Bale's somewhat protected-species status as Perez's personal signing, it is clear he will be continue to be an undeniable first choice under Zidane.